Gliding under snow covered trees through pristine valleys, past bedded elk and over frozen creeks heightens our sense of adventure and exposes us to new experiences and dangers. While cross-country skiing is a low impact sport with aerobic benefits it is not hazard free. The physical dangers of cross-country skiing include typical skiing hazards such as running into obstacles at high seeds, falling on and off of rocks and crashing into another skier. 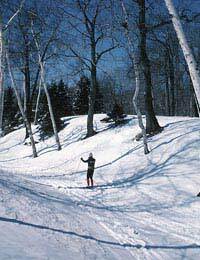 The free-heel nature of XC skiing increases your chances of falling in the snow which can expose you to hypothermia and frostbite, but decreases your chance of knee injuries. It is common, especially for novices, to become tangled in your equipment during a fall, though most often it only insights hysterical giggling and minor bruises. Bone, joint, ligament or tendon damage and lacerations are possible, as is skiing into your pole and impaling yourself, but such injuries are uncommon. If traveling off of groomed paths away from civilization pack an extra layer and first aid kit. Whenever we play in an area that is not avalanche controlled there is a chance of avalanche danger. Plan your cross-country outing carefully; ensure your chosen trail isn’t at the base of an avalanche path. If your route puts you in the path of potentially sliding snow, check the avalanche report and bring proper gear. Remember that low danger does not mean NO danger. It seems obvious, but remember also to check the weather. Storms don’t always obey weathermen’s schedules so look up the forecast for the whole week. Unexplored trails motivate us for longer jaunts; however, blindly wandering into the woods can be dangerous. If you plan to be more of an explorer than trail follower, study topographical and trail maps ahead of time. Take note of potential avalanche paths, cliffs, forks in the trail, vehicle roads, cabins or shelters and rivers or creeks including crossings. Topographical maps will tell you the grade of an area or trail as well as geological obstacles. Use this information to plan your route keeping in mind the amount of energy you will use to get up the hills. Topographical maps can also help you determine avalanche prone areas as well as snow deposits that might be harder to float through. Consult trail maps and experienced skiers for information on dangers that may not be visible on a topographical map. Determine the origination of creeks and rivers, direction of flow and crossings for points of reference to help keep you dry and on the planned trail. Practice using your compass while orienting yourself with the maps. Knowing the area will minimize your chances of getting lost, keep you from getting cliffed out and hopefully keep you out of the creek. On a clear winter day Mother Nature seems peaceful and quiet, that is until you’re being chased by a crazed moose. No matter how docile a wild animal looks, do not approach it; like humans, animals are not always predictable. Read the Darwin Awards for numerous disastrous examples. If an animal crosses your path wait for it to pass. If you come upon a sleeping or resting animal, let it be, quietly pass-by, or return from whence you came. You are visiting their home, so be respectful, and keep in mind animals like their space. In most cases, animals will not attack unless provoked. To keep the crazed moose calm, quietly move away. If it does charge, ski behind a tree, make a lot of noise to distract it, and/or raise your arms like a bear or bigger animal. Note: animals don’t wave their arms, so only do so if you are trying to look human. If you get the rare chance to see a mountain lion up close, do not panic. As with a moose, stand tall and raise your arms like bear. Speak calmingly and back away slowly. Do not make eye contact, but don’t turn and run or ski either. In the case of bears you’ll most likely to be able to pass unnoticed. Never run from a bear. If you’ve piqued its curiosity wave your arms to show you are human while backing away slowly. Standing bears are curious, not threatening, but if a bear on all fours lowers its head and bristles the hairs on its neck, get out your bear spray. Never get between an animal and its baby. Never feed wild animals. And keep your dogs close and under control. Typical winter hazards apply to cross-country skiing. Sunburn, frostbite, dehydration, fatigue and hypothermia can ruin a good trip and lead to death. Physical and environmental dangers can be thwarted with proper preparation and smart skiing, so take time to plan your adventure and pack for the worst case, just in case.